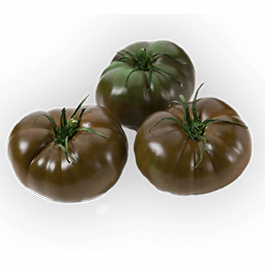 Heritage Beefs have a very rustic appearance and robust tomato flavor profile reminiscent of what you'd find at local, open air, farmers' markets during the peak of season. 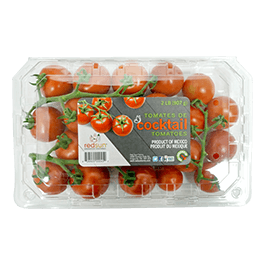 Great tasting tomatoes. 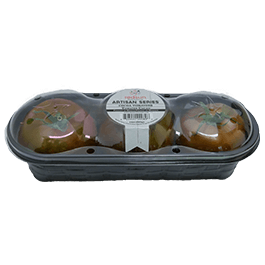 Try these sliced on a BLT, stuffed, or use as a great topper for burgers. 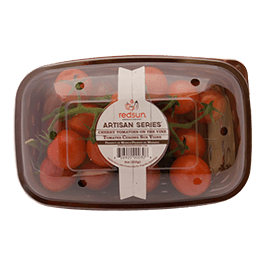 Box Size 23.25 x 15.5 x 3.75"
Box Size 19.69 x 11.81 x 3.75"
This succulent tomato variety originated in Western Europe and is very popular in France, Belgium, Switzerland, Germany as well as the Mediterranean. The taste profile of the Cocoa leans more towards savoury, earthy, or broth like flavoring. You will notice the color of the Cocoa evolves from green to brown and can be enjoyed at any stage in ripening process - you decide which stage you like best! 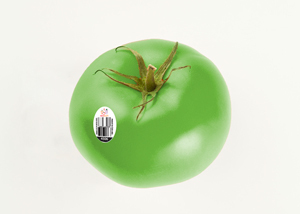 The greener fruit will possess a stronger, more robust flavor while waiting for the fruit to ripen to full brown which will result in a "sweeter" eating experience to offset pairings that are more acidic. 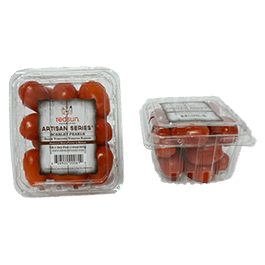 These precious little pearls are mini grape tomatoes with a robust sweet flavor. 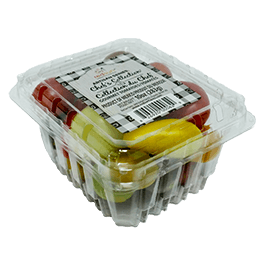 Their size and flavor make them perfect for snacking or a treat for lunches. The tiny tomato with HUGE flavor. 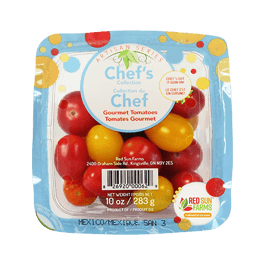 These super sweet, cherry tomatoes are great for snacking or tossed in a salad. For maximum flavor and shelf life, leave them on the vine until you are ready to eat. A delicious mix of bite sized tomatoes. 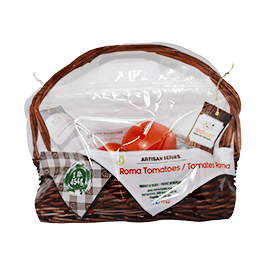 The Chef's collection includes the newest varieties of tomatoes offering an array of different taste profiles. From Seed to savory, this collection is sure to add a "wow factor" to your next recipe. 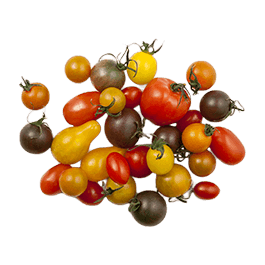 This collection of tomatoes can be enjoyed as a snack or tossed in a salad or your favourite pasta. 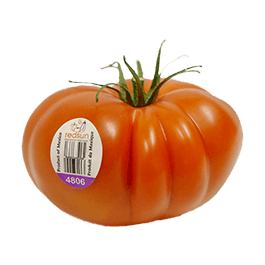 These orange tomatoes have a well-balanced flavor. The vibrant orange is are sure to add a nice pop of color to any salad, snack, pasta dish, or even sandwich. Add these to your skewers for grilling season and you won’t be disappointed. Our unique and rustic collection of home grown heirloom style tomatoes offering the most dicerning shopper an array of taste profiles. From sweet to savory the vintage tomatoes make our special reserve list. 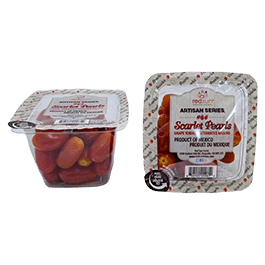 Box Size 19.92 x 13.54 x 4.41"
An Italian plum style tomato that is fantastic for sauces and canning. 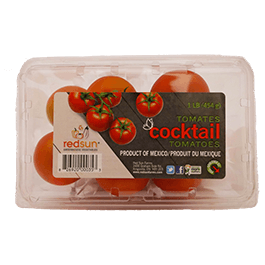 Good flavor comes in small packages with Red SunFarm's on-the-vine tomatoes. 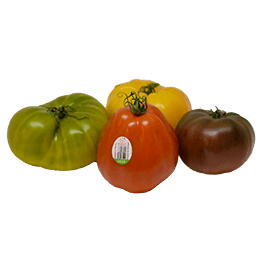 Perfect as a wholesome, colorful addition to any salad or entrée, our greenhouse grown tomatoes deliver taste that only vine ripening can bring. 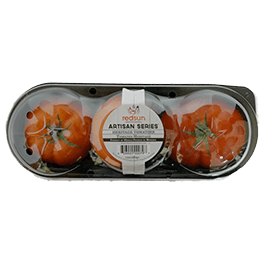 Choose from red, orange or yellow varieties, all featuring lower acidity and milder flavor.